One of the most popular ports of call on the Alaska Panhandle cruise is Juneau, the capital city of Alaska. It is the third largest urban center in Alaska with just over 32,100 residents. Juneau is, however, the most isolated state capital in the entire nation. No other capital city lacks a highway connection to the outside world. Juneau can only be reached by air or sea. It is also the only capital city in the nation that borders another country, as the city and borough limits reach to the crest of the mountains to the east that constitute the international boundary. But there is no physical connection with Canada. The city and borough also constitute the second largest corporate city in the nation, the largest being Sitka. Juneau is approximately 2.5 times larger in land area than the state of Rhode Island, yet it is only a city. The former city of Douglas, located across the channel from central Juneau is now a residential suburb. The central city, which is quite small in land area, is tucked up against the steep slopes that during winter months can pose an avalanche threat to the downtown and government center. Mendenhall with Mendenhall Valley, which is home to the majority of Juneau residents, located about 10 miles north of the central city and connected by one lone road. Mendenhall valley is the result of the retreating Mendenhall Glacier having carved its channel to the Inside Passage. The front face of the glacier is just a few miles north of the residential area and is a major tourist attraction. This is just one of many outflows from the massive Juneau Ice Field, one of the largest glacial fields in Alaska. The ice field appears to be relatively stable, but the Mendenhall and Lemon Creek Glaciers have shown retreat since the early 1900’s, part of the overall warming of the planet that has been ongoing for 10,000 years since the end of the last Ice Age. Today’s addition of carbon dioxide and other pollutants to the atmosphere are simply hastening a process that has its origins in the ebb and flow of temperature on earth for millions of years. But there is no doubt that human pollutants added to the atmosphere are harmful. The main core of Juneau is very cosmopolitan in its overall flavor, yet it bears architectural traces of the late 19th century gold rush era with its many Victorian buildings that reflected the wealth of the time. Cruise ships dock in great numbers during summer, the wharves running parallel to the city’s main street. There can be as many as five large ships can be in port on a given day, adding thousands of visitors to mingle with the local populace. Downtown Juneau has scores of shops strictly catering to visitors. In recent years large jewelry chains that are so dominant in Caribbean ports of call are now found in the Alaskan ports. It makes me wonder why a cruise passenger would book an Alaska cruise and then spend time shopping for watches or diamonds when there is so much to see in each port. Mount Roberts Tramway – Only if the air is clear and visibility is good should you take the tramway from just off the cruise dock to the top of Mount Roberts. The view over Juneau, Douglas Island and the Gastineau Channel is absolutely spectacular when visibility is good. The Alaska State Capitol – Located above the downtown, this imposing building was built in 1931, but it looks more like a bank building than a capitol. It is relatively small and unimpressive, but the tour does give you an understanding of how the state is run and why the capitol has remained in Juneau, isolated from the rest of the populace. Alaska Governor’s Mansion – Built in the early years of Juneau, this beautiful colonial building is home to the governor and a venue for state functions. It is not open to the public, but you can photograph it from the outside, and the view from the street over the Gastineau Channel makes the walk worthwhile. Macaulay Salmon Hatchery – Here you have a chance to learn about the life cycle of salmon and see fry and young salmon being raised for later release. The hatchery is located a short distance from the city center. Saint Nicholas Church – A small Russian Orthodox church constructed out of wood and serving the small native community. Juneau-Douglas City Museum – A small collection on the local history and geography makes this a worthy stop to learn more about the area. Juneau Public Library – This new building overlooking the cruise docks has a modern vibe and some beautifully designed stained glass windows. Alaska-Gastineau Mill and Gold Mine Tour – Although oriented to the visitor, this tour does help you gain an understanding of the gold mines that put Juneau on the map. Alaskan Brewery and Bottling Company – Located in the city, this is a famous microbrewery and does offer a tour and tasting. Red Dog Saloon – Very touristy, but it does somehow capture some of the feeling of old Juneau back in the gold rush days. The colonial Alaska Governor’s Mansion overlooking Juneau. 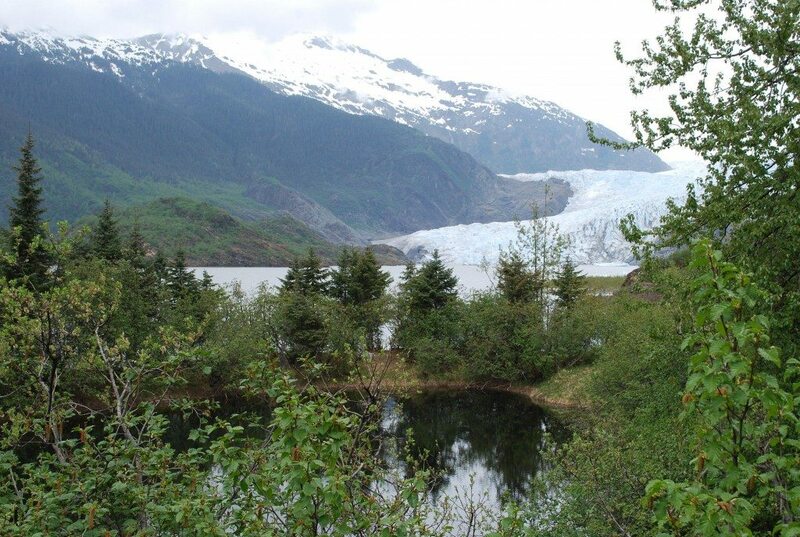 Mendenhall Glacier – The number one attraction in Juneau, this is the only urban glacier in America. There is a visitor’s center that overlooks the face of the glacier, and there is a hiking trail that brings you close to the front edge. During summer you may see the calving, that is the dropping off of large chunks of ice that splash into the melt water lake at the glacier’s edge. Your ship may also offer helicopter tours to the top of the glacier, or dog sled runs farther onto the glacier. Tracy Arm Fjord – Two active glaciers are still carving the fjord, but a boat tour will bring you face to face with this spectacular sight located southeast of Juneau. The overall scenery is quite breathtaking. Nugget Falls – Located near the Mendenhall Glacier, this powerful waterfall is very prominent. The walk from the parking area is relatively level and gives you a chance to enjoy the fresh air and scent of the trees. Perseverance National Recreation Trail – Leading out from central Juneau this trail takes you into the mountains and forests where you forget that the city center is a short distance away. This is a favored local hiking trail. Juneau is a relatively young city, having been developed during the 1880’s, when gold was discovered. The territorial capital was moved here in 1906 from Sitka, which had been the prior Russian capital since it was first founded. Before Juneau existed, the Tlingit tribe would fish for salmon in the waters of the Gastineau Channel and make camp along its shores. It was not until 1880, that Europeans showed any interest in the area, and that was only to prospect for gold, which was found at the head of what is now known as Gold Creek. Today state and federal government payrolls are the largest sources of income in Juneau year around. But during summer over a quarter million cruise ship tourists visit, spending money in the shops and restaurants, as well as purchasing tours. Add to this the docking fees, and tourism is a major addition to the city’s economy. Juneau will no doubt remain as the state capital because of the high cost to build a new infrastructure in the event voters chose to relocate the capital. The measure has failed to pass on several occasions mainly because of the high cost of relocation.